Which herbicide caused that injury? We put some scientists to the test. As part of the 20th Australian Weeds Conference Agronomy Field Tour in September 2016, the tour participants tested their ability to recognise herbicide damage symptoms across a range of crops and pasture species with the trial funded by Department of Agriculture & Food WA and Royalties for Regions™. To make it not too difficult, the guinea pigs (sorry, particpants) pre-downloaded the new GRDC Ute Guide herbicide Injury app to assist them in their quest. To sharpen their wits we also made it into a competition with extravagant prizes to be had. Herbicide injury demonstration at Muresk InstituteAfter saying I would never ever go on another Conference field tour, I had to put my money where my mouth was when Sally Peltzer and I were approached early in 2016 to organise the agronomy tour for the Weeds Conference to be held in Perth, WA. We had to make the day interesting so decided to base it at or close to the Muresk Institute, just outside Northam, Western Australia. This is an easy 1.5 hour bus trip from Perth. GRDC has recently released an app to enable growers and agronomists more easily identify which herbicides are damaging the crop. Sally and I decided to establish a herbicide injury demonstration to test the Agronomy tour participants’ brains, as well as evaluate the app. The treatments in Table 1 were sprayed across 18 crop and pasture types 15 days before the field day. No tank-mixes were used as this would have “muddied the water”. Table 1. Herbicides and rates used in the demonstration. So how did the competition go? There were 8 ‘stations’ for the contest and we split the participants into groups of 3 or 4. We wanted the modes of action causing crop damage at the 8 stations and those in the “herbicide business” also had to name the actual herbicide to help level the playing field. As can be seen from the photos the groups were busy competing. What this exercise highlighted was how difficult it can be to identify the herbicide causing crop damage. It is important to not just look at the crop, but the weeds and other species and observe how they are reacting. Knowing the time elapsed since herbicide application also makes a huge difference in assessing the symptoms as symptoms change with time and dose. For example with cool low light intensity conditions paraquat (Group L) damage to cereals can look like a number of other herbicides during the first 2 weeks before desiccation has properly commenced. Even some of the 'herbicide experts' were fooled. Catherine Borger, DAFWA, with Kerry Harrington, NZ, and two international visitors. Besides the fun, some great feedback has also been supplied to the GRDC to improve the Herbicide Injury app. After the herbicide injury competition Peter Vella and Dave Rogers from Hardi Australia discussed how modern spray technology, as used on their Saritor 5500, improves spray efficiency and efficacy through lighter booms and accurate height control . The group fascinated by the high tech Hardi Saritor 5500. Next we inspected the exhibition model of the iHSD – integrated Harrington Seed Destructor – with Devon Gilmour, McIntosh & Son, along with Ray Harrington, the inventor. Inventor and farmer Ray Harrington explaining how the iHSD kills weed seeds. 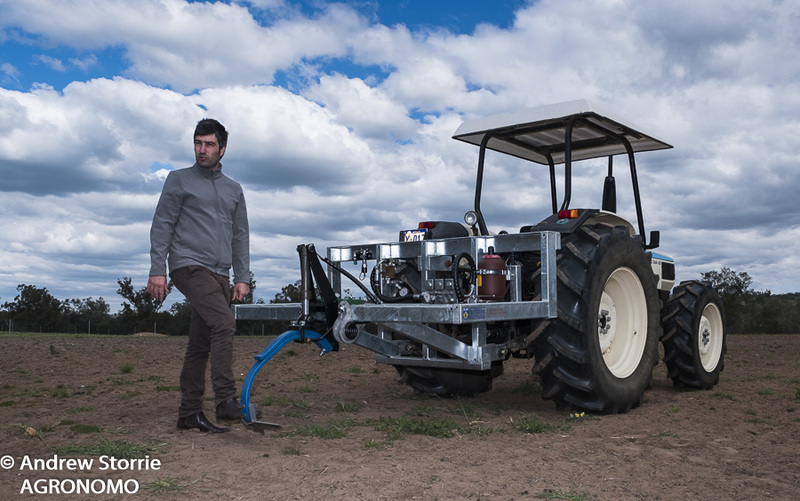 After lunch Andrew Guzzomi, University of Western Australia, demonstrated his selective cultivating tine. The tines are activated when the sensors detect a weed, digging it out. This shows lots of promise for low density fallow weed control. Andrew Guzzomi explaining the complicated path to developing a new concept in tillage.Then it was back on the bus to head out to Andrew Boultbee’s farm nearby to look at his approach to harvest seed management with chaff dumps. Andrew has a number of approaches to dealing with the dumps. He sows through them and may or may not burn them depending on the season and amount of rain received. Everyone was fascinated by Andrew’s adaptation of the dump and burn approach. Farmer Andrew Boultbee explaining how he manages weed seed production in cereal crops. After that it was back to Perth via York. I will be in contact shortly!